I was trying to find a picture of my mom and I to include with this blog. I could not find one that I could proudly share with the world! I dug deep and found this one from January 2011 and it is not even of my mom and I alone! 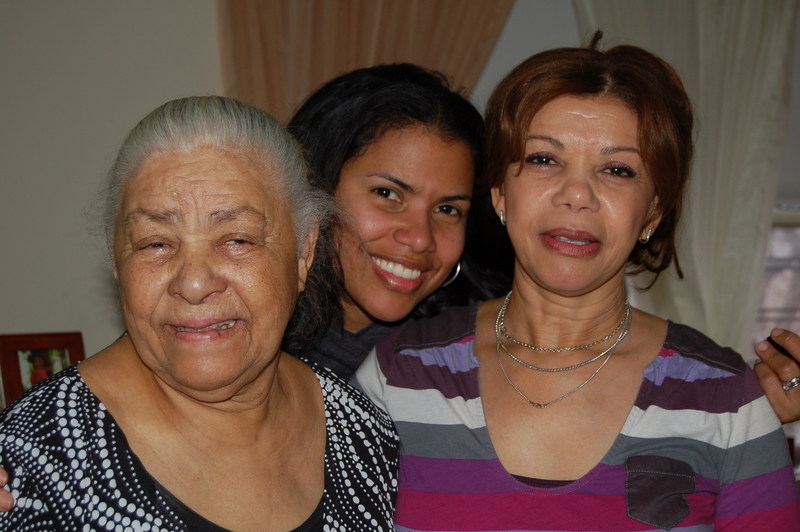 It is cool to have a pic of my grandma, my mom and I but I am looking for a nice one of my mom and I! WOA! really shaking my head. This is it! I am scheduling a session to have beautiful pictures of my mom and I. I will probably include my sisters too why not?! and now that I think about it, I have no good pictures of my sisters and my mom either… oohh boy.. Needless to say, My mom and us sisters would definitely LOVE to have beautiful pictures displayed where we all look amazingly awesome, relaxed and happy. For this we definitely have to schedule it! ha!There should always be time of mom/daughter pictures; life is full of surprises. This will be a yearly event! it has been blogged! After this realization, We’ve decided to run a contest dedicated to Mothers and daughters. A Mother/Daughter session for Mother’s day! This session will be for you and your mom. Please visit our facebook page for more details. No need to be a fan to enter but a like would be awesome 🙂 Thank you for visiting!! One lucky winner of the amazing Newborn To One package is announced. For more information about our Newborn to one package please visit my website http://www.anagiltaylor.com.